It is my desire to help the children of the world especially the poor kids who may not have all the opportunities to study and learn. 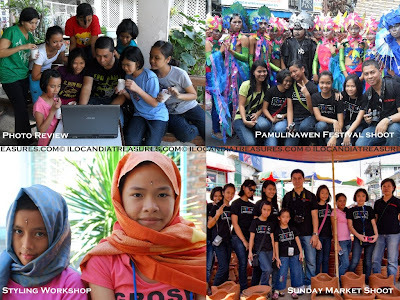 So I was prompted to carry out a project called Kids on Project Photography (KPP) and launched it in my home base Laoag City. Initially my target was implementing it to the school of children with disabilities. I had visited them a few times and I observed it to be the most challenging and difficult one because of their physical and mental limitations. Then my friend Ms Mai Sapinit from the Redemptorist Missionaries told me that an orphanage was looking for a teacher to teach art and photography to their kids. So I did not wait a moment and headed to the center where I met the nun administrator and the kids and implemented the project at once. Kids’ Project Photography is an educational project that aims to teach the art of photography to the children. It is also a vehicle or medium to teach them the culture of different people. It has also the objective of developing the self esteem of the children to deal with everyday life. Tahanang Carmela d’ Amore is the recipient of the charity project. It was started on September with a total of ten female children. This orphanage center is being run by the Daughters of Divine Zeal. I conducted several activities in line with photography. 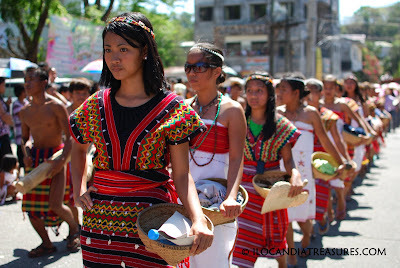 The Tinggians is a group of indigenous peoples based in Nortwestern Luzon. They are also called Itneg because they live near the Tineg River. 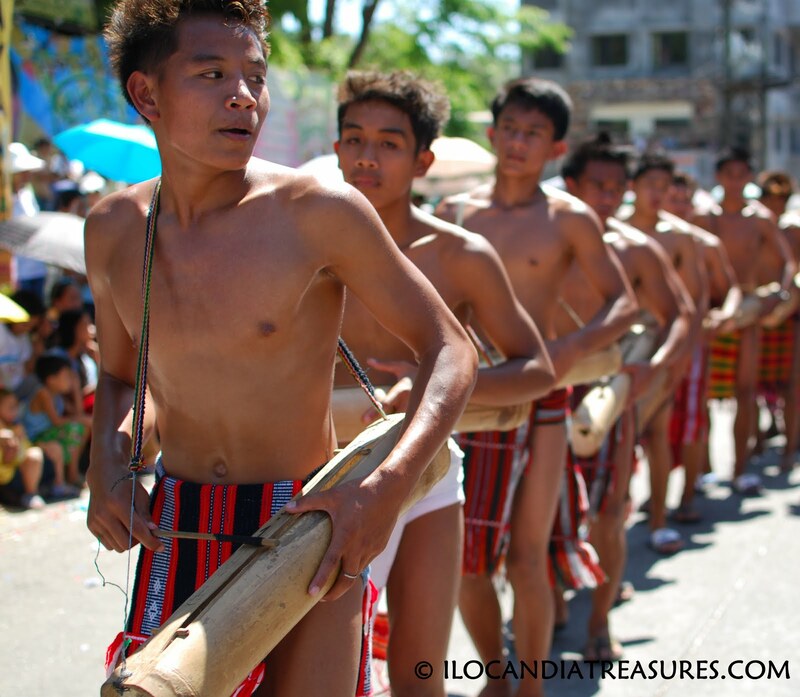 Other terms used for their names are I-tineg, Tinguian, Itinek, Tinguianes, Mandaya and Tingian. 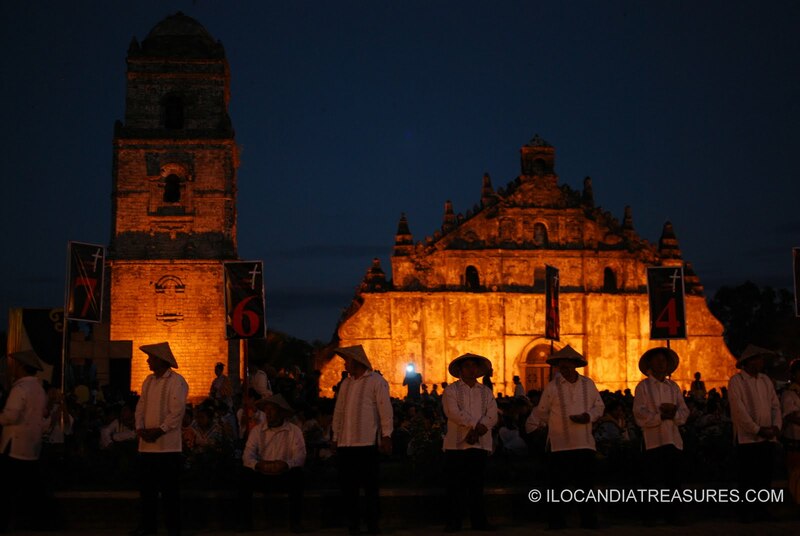 They reside in the provinces of Ilocos Sur, Iloilo and greater concentration in Abra. There are two main groups of these Tinggians. These are the valley Tinggians and the mountain Tinggians. The former is a homogenous group and its population is found in the lower reaches of Abra that depends on wet rice cultivation. The latter’s population is found in higher elevations that thrives on dry cultivation and rootcrops. I found out that there are subgroups for these IP people. 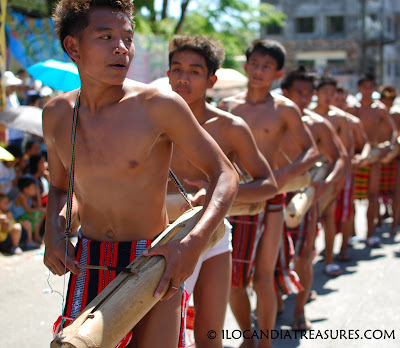 They have subgroups Adassen, Masadiit, Inlaod, Binongan, Aplai, Banao, Gubang, Luba, Maeng, and Balatok. 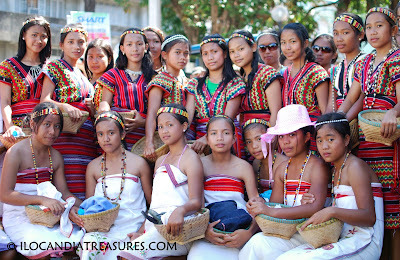 When I joined the Kawayan Festival in Abra recently, I met this group. I saw them partcipate in the parade. They were singing an ethnic song accompanied by the beat of patpato as played by the boys. When I interviewed them they specified that their group is Tinggian Masadiit. I was surprised to learn that some of the tour packages in Chiang Mai offer Thai cooking. They will take you to the market and shop for the ingredients and materials needed for the cooking and they will teach you the step by step cooking with actual hands on. After the cooking session, of course eating will follow. So whatever is prepared one has the privilege to eat everything. What a good culinary exposure. But I missed this and I would like to try this next time. 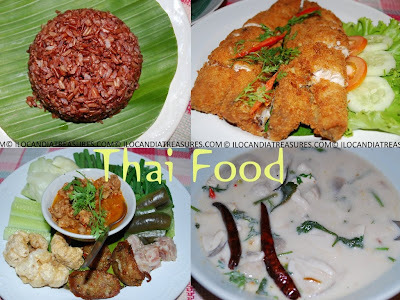 My experience of the Thai cuisine started from eating at the restaurants to the side street stalls. Thailand is really haven of good food. From noodles to full meals and to desserts, one cannot stop but appreciate every recipe. I learned to love eating spicy noodles and they are really hot. Tom yam is a soup that is hot and sour made from lemon grass, kaffir lime leaves, galangal, dried chillies and lime juice. It is usually added with prawns and is called tom yam kung or chicken and is called tom yam kai. From the street vendors I saw them sell khanom wun. These are desserts made with an agar gelatine. The colours represent different flavours. I saw also small donut balls. In one of the dinner hosted by my Thai friend in Chiang Mai, I was sampled with fried fish and Thai red rice which is shorter and wider seed which has nutty flavor and has high nutritional value. She also ordered a platter of steamed vegetables and meat with a spicy dipping sauce. Thom khai gai was also served to us. It is a spicy and hot soup which is made of coconut milk, galangal, lemon grass and of course chicken. It was really very good to indulge with Thai food. Hoping to get another culinary adventure next time. 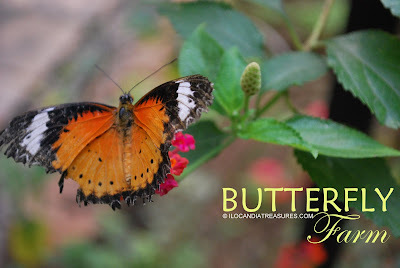 On the following day after our visit to the Golden Triangle and the hilltribes in Chiang Rai, I went on a group tour back in Chiang Mai to an orchid and butterfly farm where I saw lovely butterflies flying and touching the flowers in the garden and they were fed with pineapple pulp. We had a short lecture on how to grow orchids in a bottle. 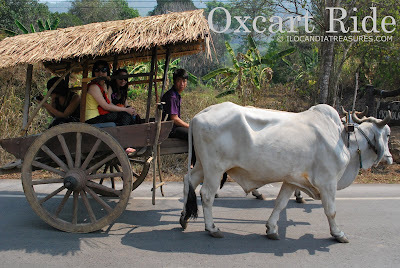 Then we proceeded to the Maetang Elephant Park where we got an oxcart ride initially going on a short distance. We then trekked the area to see and get close to the elephants. I saw them bathe in the river where their handlers let them plunge into the water on their side and turn around while they were being brushed by their caretaker. 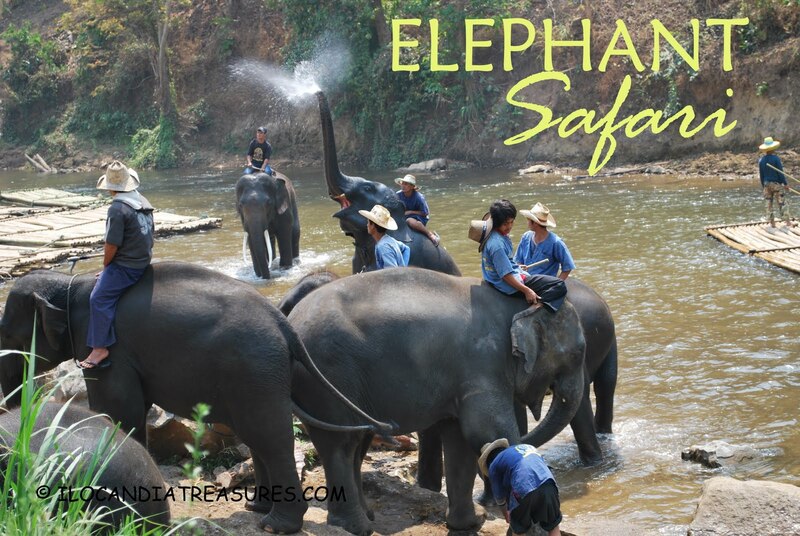 These elephants even played with water splashing from their proboscis or trunk. Elephants are the largest land mammals living today. There are three different types of elephants namely: African bush elephant, African forest elephant and the Asian elephant. They have a gestation period of 22 months which is very long. It’s nearly two years in the making. An elephant may live up to 50 to 70 years old. Elephants are symbol of wisdom especially in Asian cultures and they are popular for their memory and intelligence. Elephant’s level of intelligence is similar or equal to that of a dolphin or other primates. I had confirmed this wit and mind of this mammal when we were treated to an elephant show in the park. 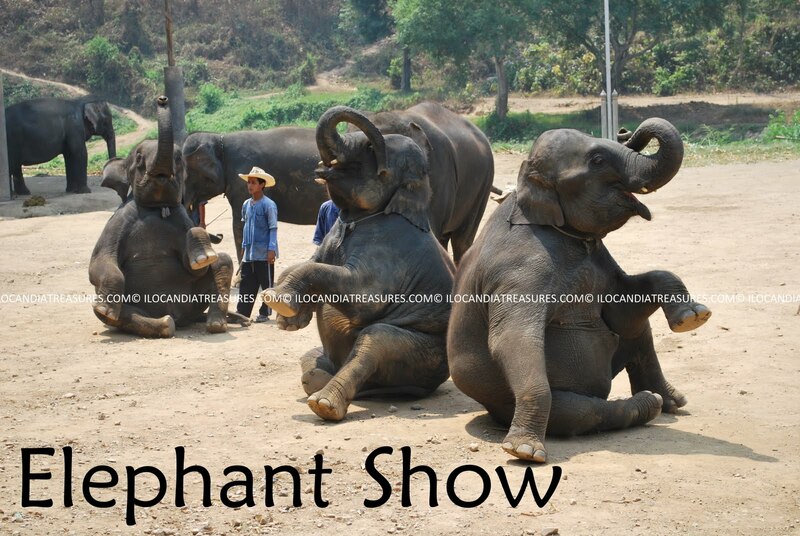 Around five elephants paraded and entered to the show area. They made various formations, they danced to a disco music, they played football, and one elephant was tasked to draw. I was really amazed to see them perform these various tasks. I had also had an elephant ride around the park passing through the lush of the forest, along the local villages and have crossed rivers. I shared a ride with one lady from Hongkong. We rode an elephant that is 45 years old. One elephant calf even went with the mother elephant and played in the water when we crossed the river. Then we had a bamboo raft cruise along the river for one hour. There were some ambulant vendors who sell bottleds in the river. Finally we visited a resort with a waterfalls. I was accidentally left there by my group because I was engrossed of the falls. Luckily one tour vehicle hitched me and took me to downtown. This was really an amazing trip I made in Northern Thailand. There were so much of discoveries. This is the video entitled Elephant Safari. This is the video on the tricks and skills of an elephant entitled Elephant Show. After coming from Donxao, we proceeded to Mae Sai, the border of Thailand and Myanmar. Some of the Westerners from our group attempted to enter Myanmar and our tour guide insisted that they don’t have to do it since it would be difficult because of many questions asked by the immigration. Only one of them successfully did it. Later, we went to visit the hilltribes. This is a term used to describe the various tribal people who migrated from China and Tibet over the past centuries. They inhabited Northern Thailand especially Chiang Rai and Chiang Mai because of its thick forests and mountainous terrains that make them subsistence farmers and use slash and burn farming techniques. 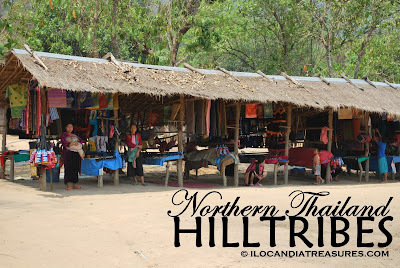 There are actually six groups of hilltribes in Northern Thailand namely: Akha, Karen,Lahu, Hmong or Miao, Mien or Yao and Lisu. 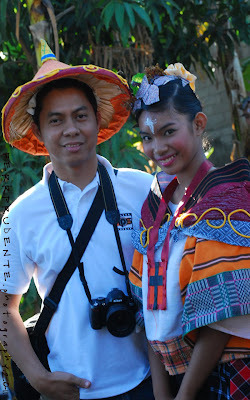 I am quite fascinated with these indigenous people because they wore colorful costumes and they live a simple life. They speak distinct language and with rich culture. From the cultural community of Karen group, it was fun to be interviewing them. Though it’s difficult to communicate with them because of language barrier, they know a little English, sign language also helped. I asked also our guide to translate some questions for them. They are situated in a village where they put up stalls to sell souvenir items. They do loom weaving to produce fabric and they make bags and other items out of it. Various handicrafts were on display for sale. Their group is being supported by the Thai government. Although its Buddhist nation, majority of these cultural communities practice Christianity religion. 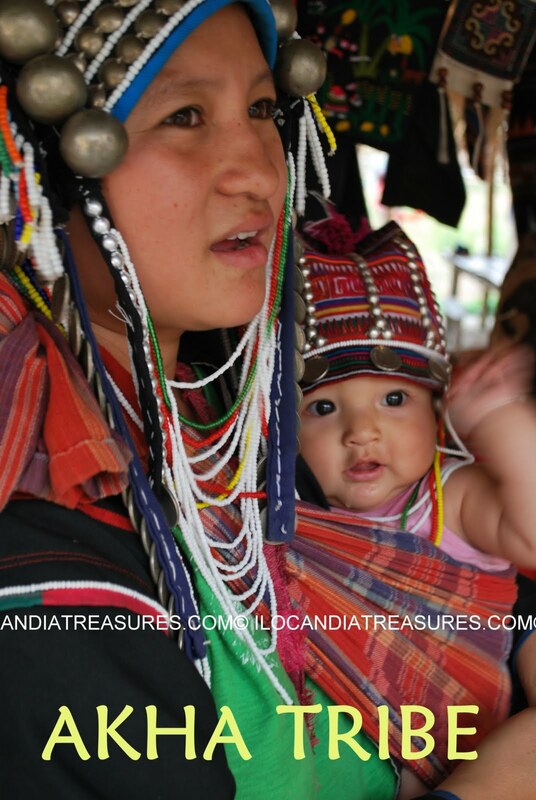 Karen people are originally from Burma who speaks Sino-Tibetan language. They make up 7 percent of the total Burmese population. A large number can also be found in Northern Thailand. They don’t want to be called Karen since it means primitive people but now the term is not being called that way. There are subgroups of these people such as the Red Karen, White Karen, S’gaw Karen, Pwo Karen, and Paku Karen. The people with neck rings or so called long necks belong to Padaung under the subgroup Red Karen or Karenni. Kayan Lahwi or Long Necked Karen or Giraffe Neck Women. Brass coil is placed in the neck of women who started to wear it since they were five years old. Each coil is replaced with a longer one as they grow old. The weight of the brass pushes down the collar bone and compresses the rib cage that made the neck looks longer. The neck is never lengthened as what they popular say. The hypothesis made by anthropologists with this culture of Karen is that the rings protected the women from becoming slaves because they become less attractive to other tribes. But according to our guide, he said that wearing the ring is their cultural identity being associated with beauty. Akha group is one of the dominant cultural influences in the area and closely related to the Hani of Yunnan province of China. They wear nice head gear whether a baby or an old person. Old people from this group believe in shamanism where Goddess spins the universe and other beliefs on spiritual world. The group gives emphasis on genealogy where they teach their children early of the family history and particular about honoring their ancestors and parents. 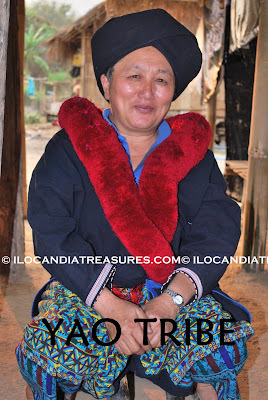 Yao nationality is a group of people who cover their head with a black or red scarf. They substitute this also with a turban that can go in different forms. They are one of the minorities in China who migrated to Thailand, Vietnam and Laos in the early 19th century because their lands were taken and also for the reason of opium trade. They have a typical house that is rectangular in shape made of bamboo and wood. Yao is also called Mien Hill Tribe who had a written language long before unlike other tribes. 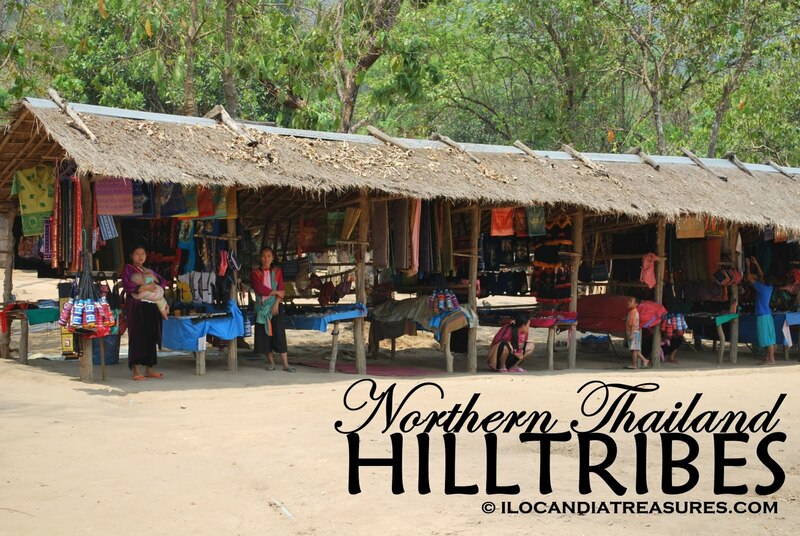 They are considered to be the businessmen among the hill tribes. 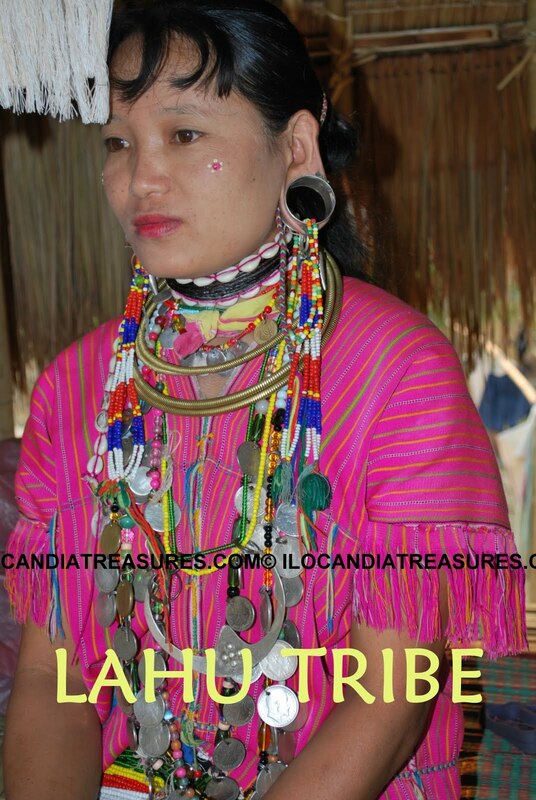 Lahu people have originated from Southwest China and they have big ears. Its alternate names are Ladhulsi and Kawzhawd. It has also its subgroups namely: Red, White, Black, Yellow and Shehleh Lahu. It refers to the color of their costumes. They practice animism, Budhism and Christianity. 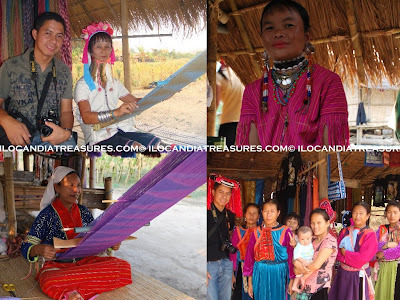 Lahu women are skilled in back-strap and foot-treadle loom weaving cloth. Lisu group is a Tibeto-Burman ethnic group who inhabit the mountain areas of Burma, China, India and Thailand. They originated from eastern Tibet and they are composed of 58 different clans. The most popular subgroup is the Flowery Lisu of Thailand. 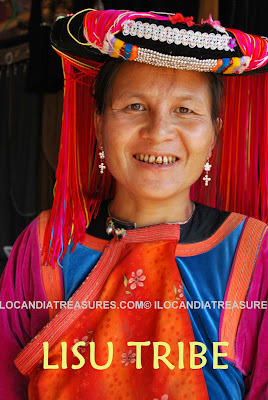 Lisu women wear brightly colored dresses. They wear multi-colored knee-length tunics of red, blue or green with a wide black belt and blue or black pants. Sleeve shoulders and cuffs are also decorated with a dense applique of narrow horizontal bands of blue, red and yellow. 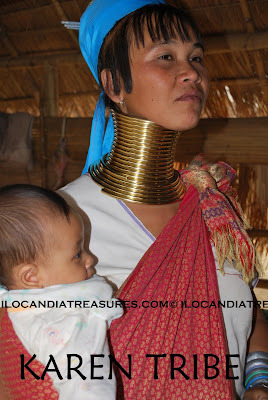 This is the video of the Long Necked Karen people. Hmong hill tribe is also called Meo that belongs to the group Miao ethnicity of Southern China. The people make houses that sit right on the ground and live there, not on stilts as do most on the other tribes. These indigenous people are diligent, patient, and independent people, fond of wearing their silver ornaments during ceremonies. They are much devoted to the sky spirit. They practice a strict male-female division of labor even more than the other tribes. One custom that especially illustrates this custom is that of giving a newborn boy a gift of metal from which he will one day forge a weapon, while the newborn girls receive no special gift. This is the video of the hilltribes Akha and Lahu. We were given a visa like coupon before we crossed the Mekong River. It was the one given instead of a stamp on the passport since they don’t have an immigration office there. 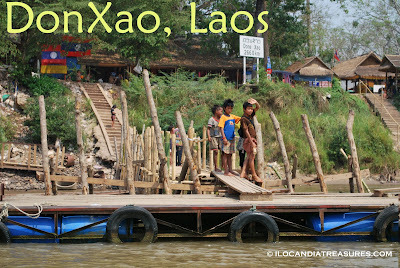 We paid around 400 baht for the boat ride and we were taken to this small village called Donxao or Done Xao. It is a big island in Mekong River in the territory of the Bokeo Province of Laos. 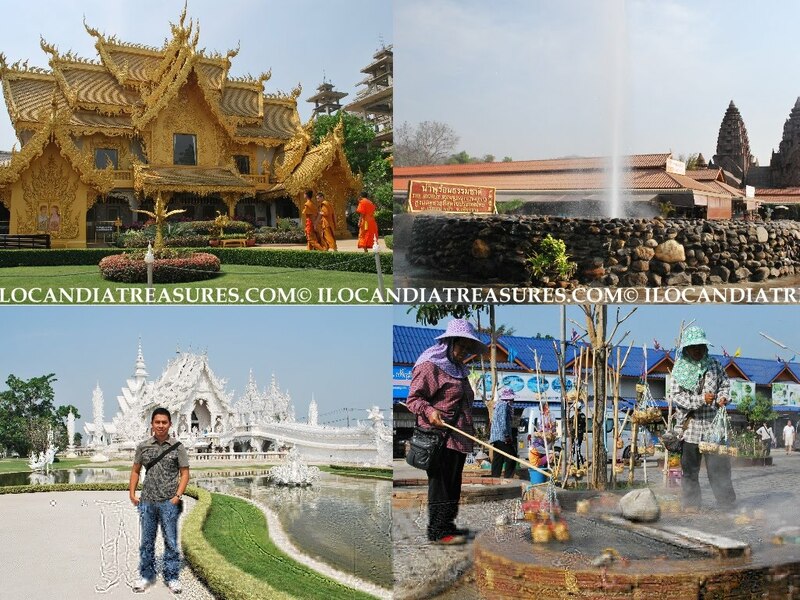 It has an area of 38 hectares situated near the golden triangle sites where Laos Thailand and Myanmar borders meet. Bokeo is a mountainous province popularly known for its sapphire mining industry and it’s a home for large number of ethnic minorities of Laos. The country is officially called Lao People’s Democratic Republic and it is a socialist republic. It is part of the French Indochina since it was colonized by France and gained its independence on July 19, 1949. It has a total population of 6.8 million as of 2009. I have visited its capital Vientianne in 2007 and saw my local friends there. 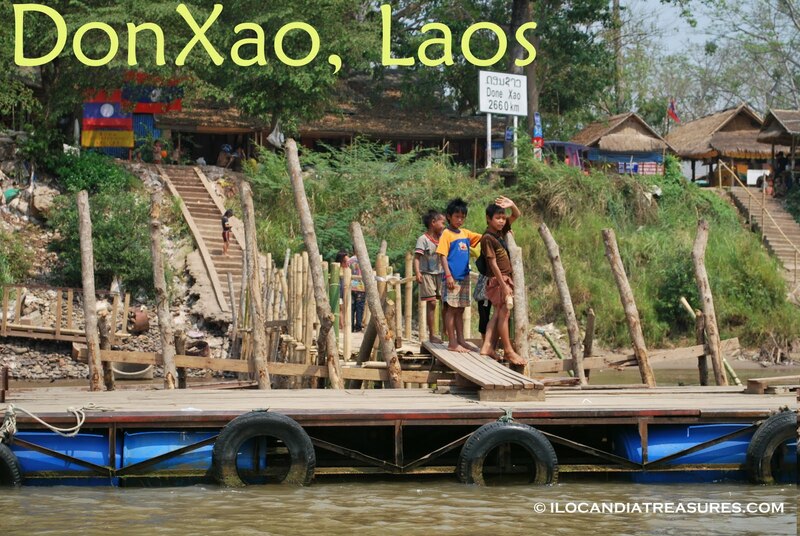 I did not expect that I can see Laos for the second time but it was just at its border. From the boat we are riding, we saw some local people waiting for guests. I have seen the flag of Laos and took my picture with it. There were stalls that sell their wares in the area. 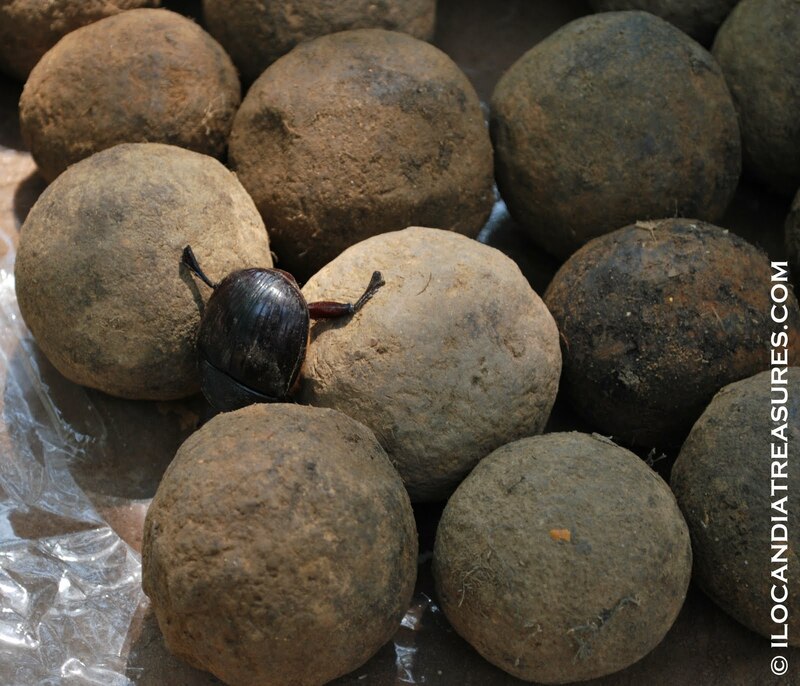 I have seen a family that sells rolling dung that when they crack a grub or larva of beetle comes out from it. It’s a delicious exotic food they say. 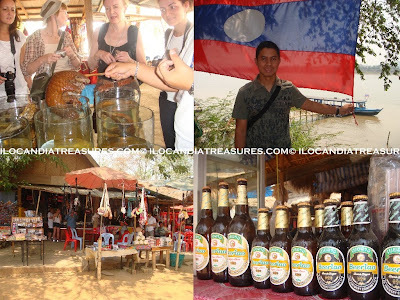 Our tour guide showed us varieties of alcoholic drinks from its popular Laos beer to the wine with submerged animals in it such as turtles and snakes. He scooped some wine for us and I have tried drinking it. It’s the same taste like wine. There were handicrafts being sold in other stalls such as bases, textiles and decorations. The prices are much cheaper here compared to Thailand. One can also haggle with the prices. After an hour of visit which was really a quick one, we headed back to the Thailand border by the same boat. 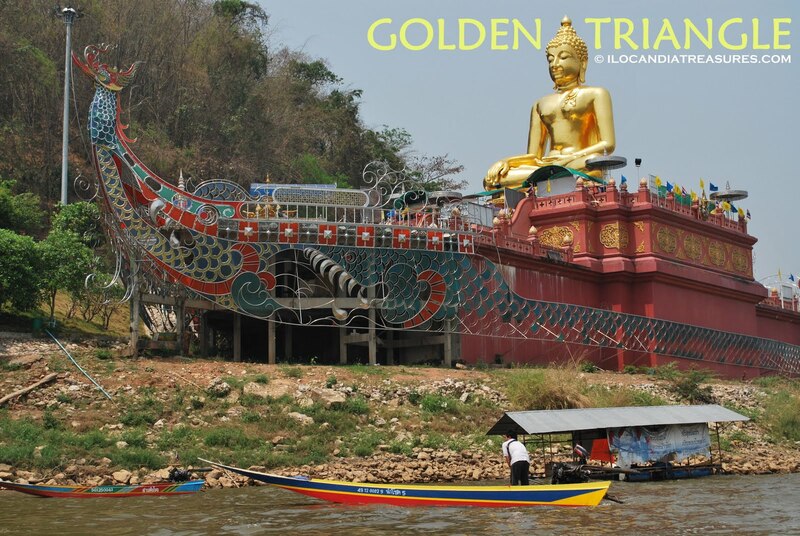 From Chiang Rai, we proceeded to the Golden Triangle. This is where the borders of the countries Thailand, Laos and Myanmar converge or they call it the junction. The province of Chiang Rai as the northernmost part of Thailand is being bordered by the Shan State of Myanmar and Bokeo of Laos. It also designates the confluence of the Mekong and Ruak Rivers. It has an area of 367,000 square miles with the mountains of Thailand, Laos, Myanmar and Vietnam overlap. We paid fees at the tourist office then we boarded a boat and headed to the border of Laos. On the side of Thailand, there is giant golden Buddha that we saw. Many boat ferries were on standby. 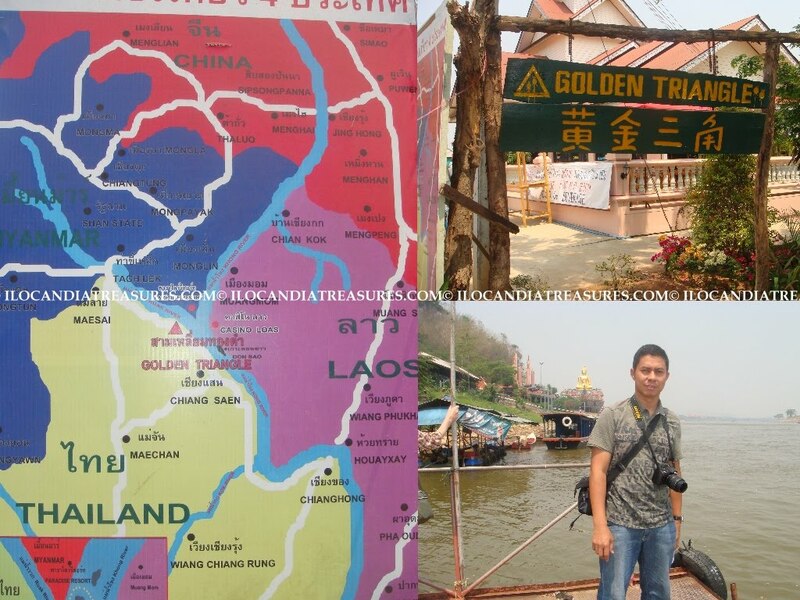 While crossing the river, our tour guide told us that this Golden Triangle is one of Asia’s main illicit opium-producing areas. This was an unsafe area because of the drug smuggling across the borders. Most of the opium and heroine were produced in Myanmar and were transported to Thailand-Burma border and distributed to towns in Northern Thailand down to Bangkok. 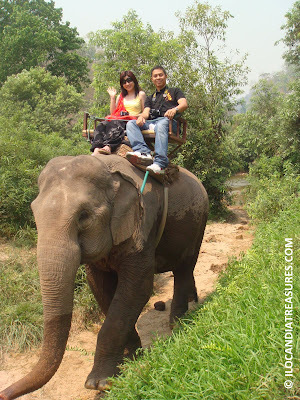 This area now is being promoted by the Thailand tourism as one of destinations of their guests. 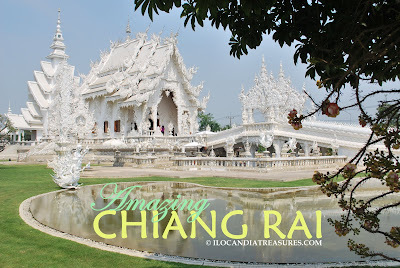 It was exactly a year ago when I went to visit the province of Chiang Rai in Thailand. From Chiang Mai, I took a package tour and the trip was about one hour dropping by and later headed to the Golden Triangle. Chiang Rai is the northernmost part of Thailand. It is bordered by the Shan State of Myanmar and Bokeo of Laos. 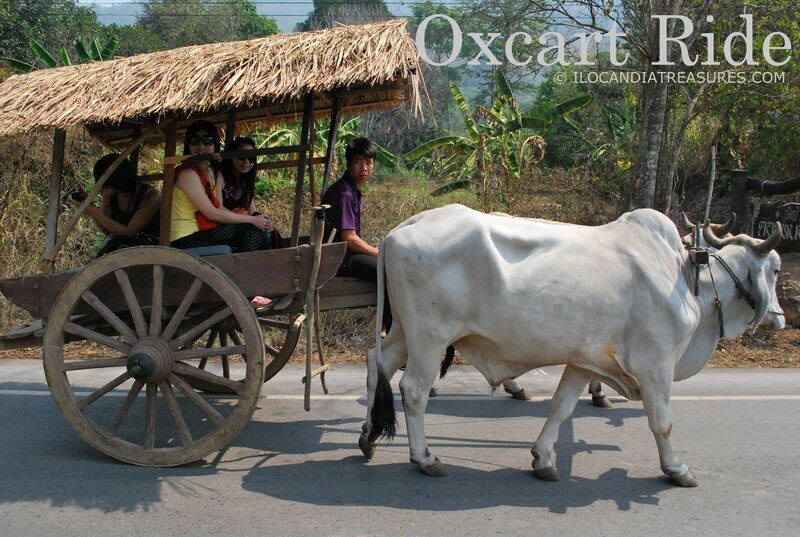 It was a former part of the Lannathai kingdom for many centuries and became a province of Thailand in 1910. This was an exciting trip because I saw the highest natural hot spring in Thailand (Nampuron Tavieesin). The hot water really gushes from below and the height is about 5 meters. The temperature of the water is at 85 degrees centigrade. I saw some women vendors boil the eggs in the hot spring water. It was just amazing to see that it only takes for about 3-8 minutes to boil the egg. It’s also exciting to boil your own basket of eggs. Each basket cost around THB20. Another great attraction in the province is the white temple. It is rare that you see this kind of temple. Gold is the usual color of temples in Thailand. It is a contemporary unconventional buddhist and Hindu temple located in the province specifically in Northern Thailand. They call it Wat Rong Khun in Thai and its construction started in 1997. They say that its style of white color and white glass would signify Lord Buddha’s purity and wisdom respectively. The design was really stunning. I had to cross its bridge to get inside. The bridge signifies the cycle of rebirth and the big circle with fangs I saw was the representation of hell or suffering. I removed my shoes upon entering. I saw the four walls and even the ceiling with paintings. Bizzare modern images were depicted on the paintings such as the Batman, Spiderman, Keanu Reeves of Matrix, Coca-cola and even the images of President George W. Bush and Osama Bin Laden. Finally this time I was able to catch and watch the Abrenian Kawayan Festival in Bangued in celebration of the province’s foundation anniversary. 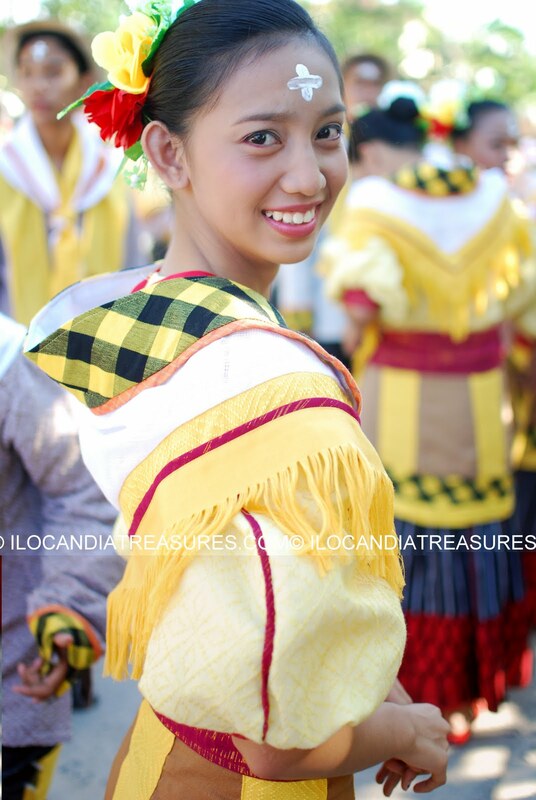 I was late last year because I assumed that the grand parade will be held in the afternoon.This landlocked province belongs to the Cordillera Administrative Region in Luzon and was founded on March 9, 1917. I arrived at around ten in the morning and the grand parade was ongoing. 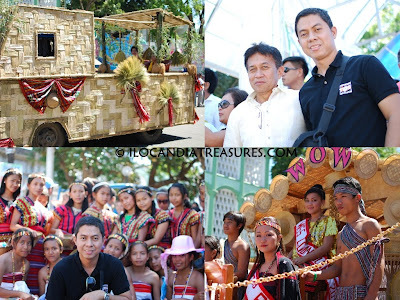 I rushed to the capitol and I saw the people from different municipalities and government agencies on parade. Some of them have their floats made of bamboo. 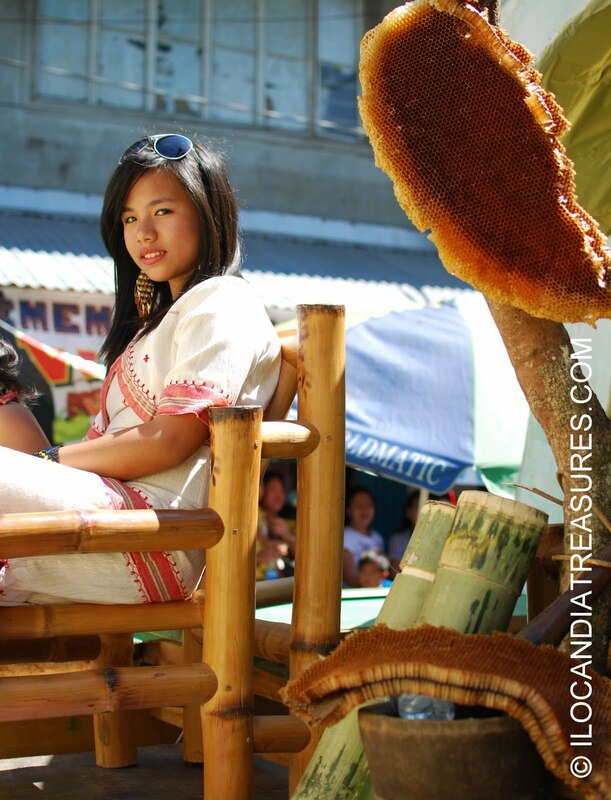 Abra is known to produce bamboos aside from the tobacco. Aside from the beautiful and creative designs of the floats, they also make various handicrafts out of bamboo. They make bags, baskets, fans, chairs, tables, even musical instruments like patpato and many others. One very important use of bamboo is for building a house or shelter. I have seen several houses along the hi-way made up of bamboos. 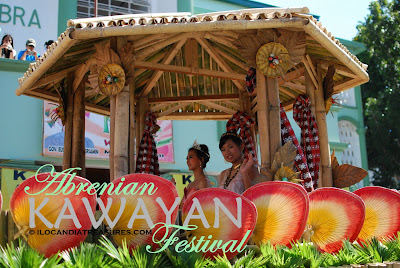 On the floats were stunning muses who wore the ethnic and local costumes. I have seen the cultural group of the Tinggian Masadiit who sang and dance during the parade. The males wore the g-string and played the patpato to produce music for their performance. There was also a showcase of sakuting dance performance by a group of men. They used the bamboo sticks. An exhibition of taekwondo stunts was conducted by international champions. Big bikes joined also the parade. I personally met Governor Eustaquio Bersamin during the event. He was cool because he cheered for every contingent parading infront of the capitol. He even sat at the stairs of the stage together with the balikbayans. The province also conducted a trade fair entitled Padaya at the SM Megamall. At home, they held Farmer’s Day where they showcased the rarest products and livestocks. 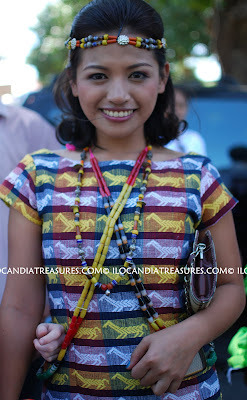 They also had Youth Day, Women’s Day, and pageant for Little Miss Abra. This provincial fiesta is a showcase of arts, crafts and cultures by the locals and indigenous people. 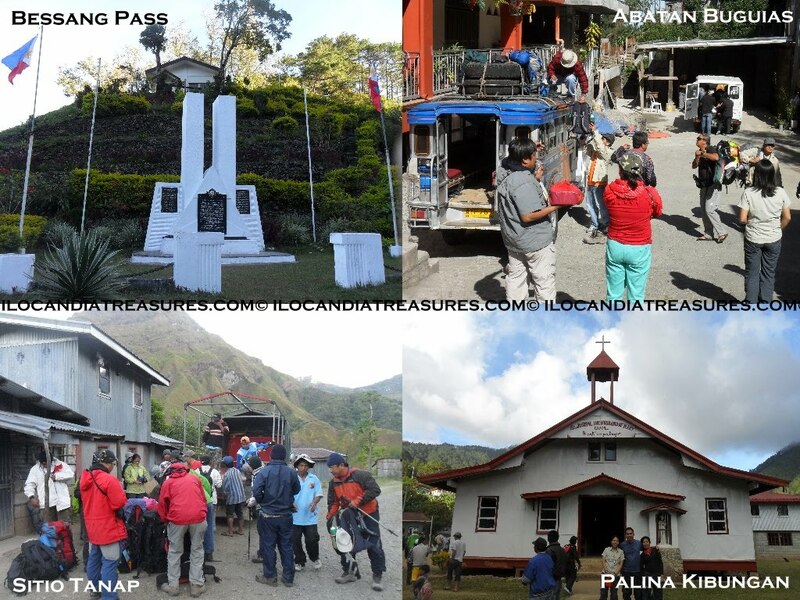 It’s a way to preserve and promote the treasures of the community. This is the video of the sakuting dance performance. Guling-guling is an annual festivity that signifies the last day of merrymaking before the Catholic community's observance of the Lenten Season. It was introduced by the Spanish friars in the 16th century and thereby being celebrated for over 400 years now. This is a much more somber celebration compared to the Fat Tuesday of New Orleans and Mardi Gras of Brazil. 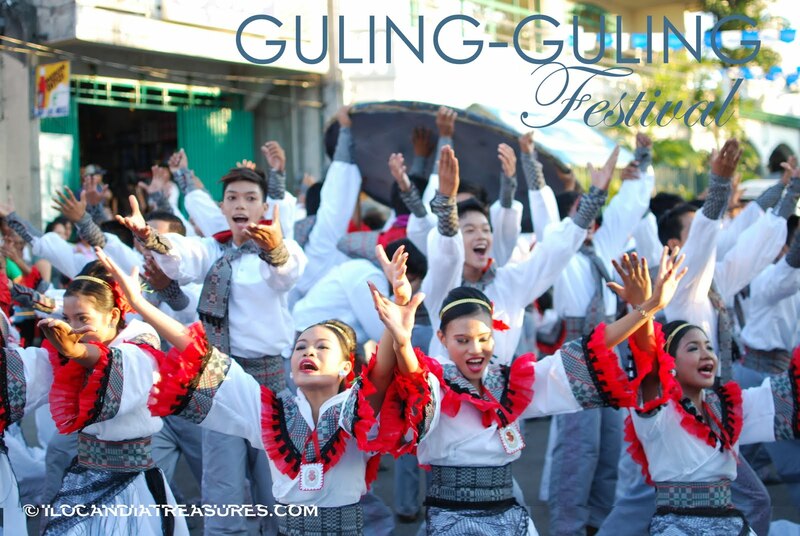 It’s my fourth time to witness this Guling-guling Festival in the town of Paoay. It never ceases to amaze me. It keeps on getting better every year. This year was a fabulous one because it showcased a dramatic highlight of the celebration that is the smearing. It is the term where guling-guling was taken. It is the marking of a cross on the forehead of the person with white rice flour. All the lights were put off as the dancers came altogether infront of the wonderfully designed stage with lighted candles on their hands. 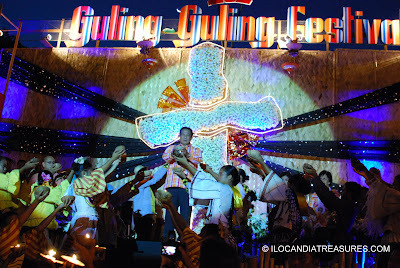 Meanwhile Mayor Bobby Clemente raised the coconut shell with the wet white rice flour in it while a beautiful meditational sound of music was played. It is a ritual where the mayor marks the forehead of his constituents with the cross. This time, he passed on to the vice mayor and to the council members the privilege to do the smearing of the people. I was also smeared on the forehead with the cross by a council member. 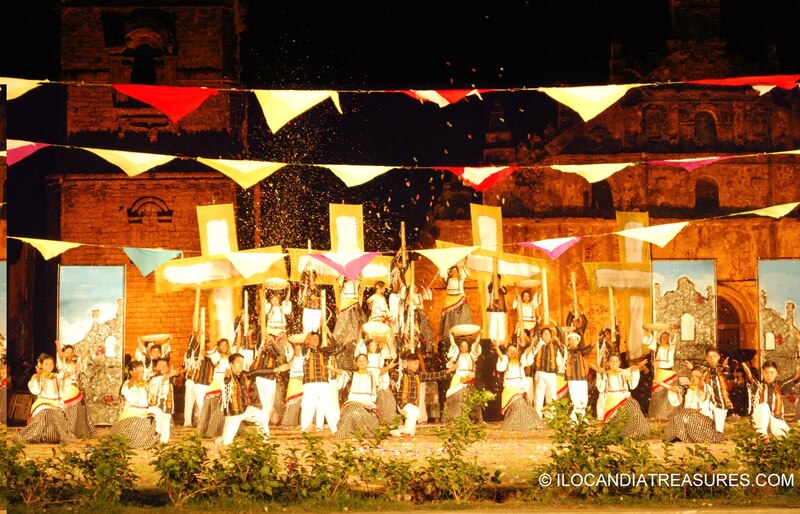 A couple of days before the main event, a cultural night entitled Talugading ti Paoay was held at the lobby of the UNESCO World Heritage Paoay Church. 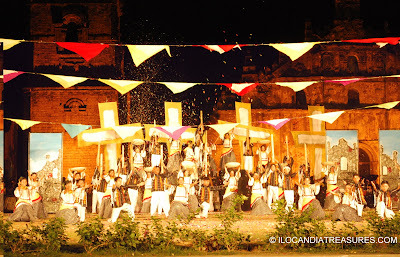 There were several dance performances that portrayed the local and other dances in the region, choir singing of children and adult groups interpreting Ilocano songs particularly depicting Paoay and the Bukanegan, a humorous discussion of parties in favor and not of the promotion of tourism in Paoay. It was really cool to watch the people perform in the open air. On the main event of the Fat Tuesday, a dudol making was conducted in the morning compliments of Vice-Mayor Guererro. It is a delicacy of Paoay composed of ground glutinous rice mixed in molasses. It is a continous stirring of the mixture in a big wok. This delicacy is usually being served to the guests during the afternoon event. Then the street pageantry followed in the afternoon. All the dancers showcased their best abel costumes. Abel is the loom woven local textile. There were ten groups that participated and every group sport a new fashion design each year. They swayed to a one uniform music with the main dance element of kumintang. They sang Sabunganay. 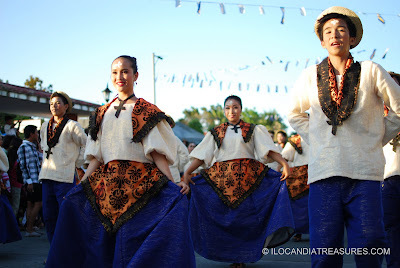 For this category of street dancing, contingent number 9 came out as the first place followed by contingent numbers 10 and 8 as second and third placers respectively. The dance showdown came after the smearing highlight. It was really an amazing show put up by the various groups complete with props and materials. They depicted the Christianization of the town with some of the cultural traditions and local occupations. My judgement of the winners coincided with results from the board of adjudicators. Contingent number 10 came out victorious as the first placer richer by Php75,000.00. The performances of contingent 1 and 9 came into the second and third place respectively. Capping the event was a grand fireworks display infront of the church. This is truly a celebration of life and faith. A celebration like this underlines the importance of the cultural treasures in the life of the community. This is the video of the 1st place winner in the dance showdown. This is the video of the 2nd place winner in the dance showdown. This is the video of the smearing ceremony- the highlight of the Guling-guling Festival. This is the video of the grand fireworks display. With the climb we had to Kibungan range, I was able to witness the rice harvest in the province of Benguet. They call it ani in the local dialect. It is harvesting the ripe palay. The rice stalks are cut one by one and then the harvested palay are measured by the bundle or they call it tan-ay. It is a unique and traditional way of harvesting rice by the folks of Kibungan. I saw two men and an old woman who do the harvest. They do it manually with their hands and the use of a rakem. The procedure is called gapas. It was my first time to see this type of harvest. 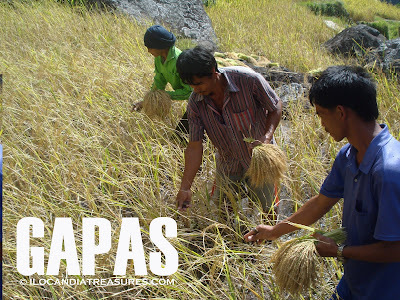 After the cut, they tie the rice stalks in a bundle and dry in under the sun by placing on top of the rocks. 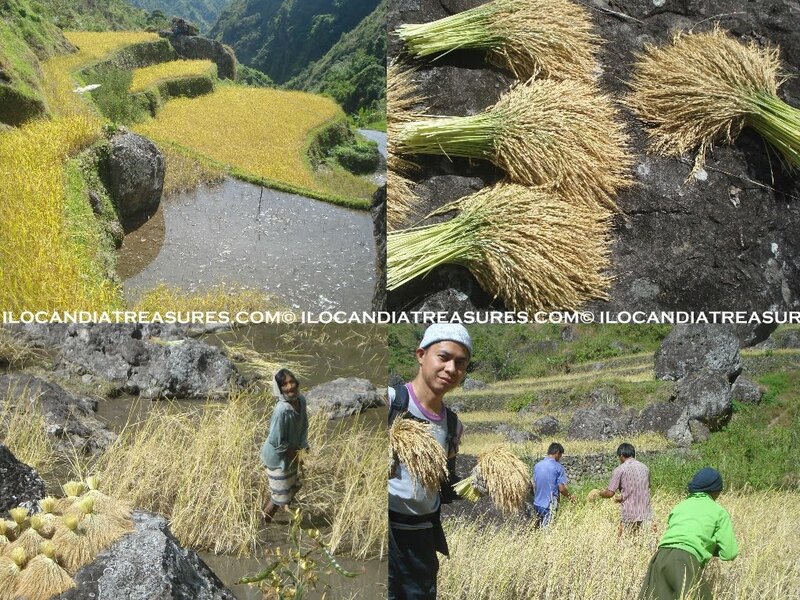 Rice is the principal crop planted in the rice terraces along the mountain slopes of Benguet province. They have two cropping seasons, July to August and harvested in December to January and March to April which is harvested in May to June. They call these cropping seasons Talon and Kintoman respectively. There are different varieties of rice being planted in the province of Benguet. There are about 83 rice varieties being cultivated. 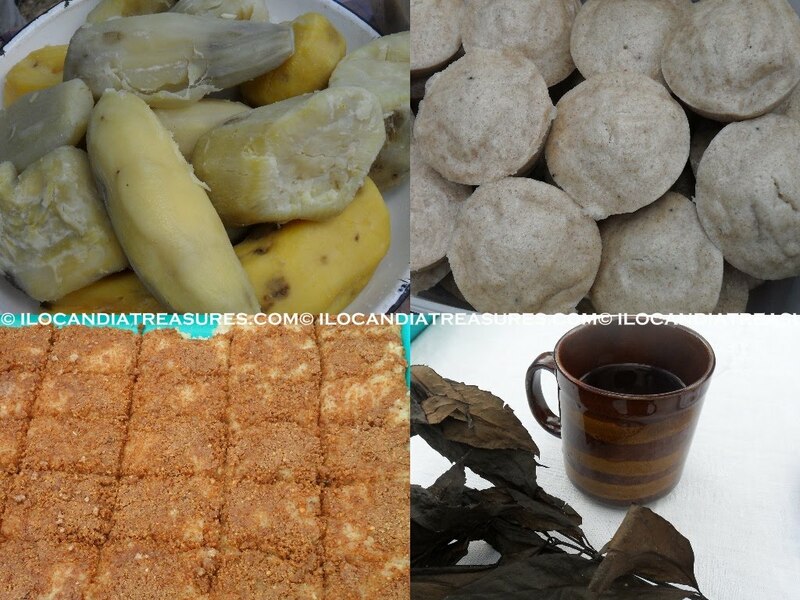 Some of these are the diket white and red, balatinaw, red rice, white rice. I was surprised to learn that each town has its own rice varieties. Good thing about this rice is that it is organic. During our visit to the different communities in Benguet we were treated with series of snacks and lunches. We were lucky to be served and had tasted the delicious native food. 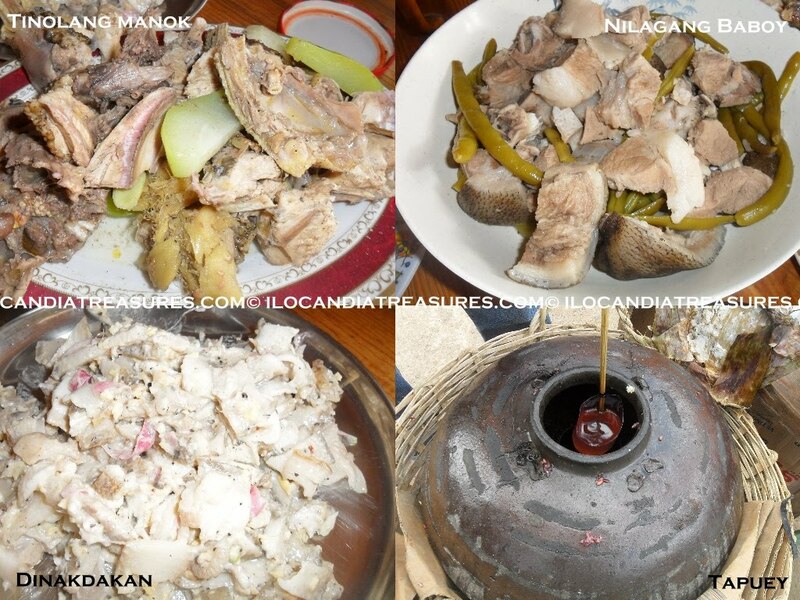 For the main dishes, dinakdakan was served which was made of pork tossed in mayonnaise. The native chicken cooked as tinola is one of my favorites. Native pig is usually butchered and prepared for meals in this highland. Native pigs are black in color. 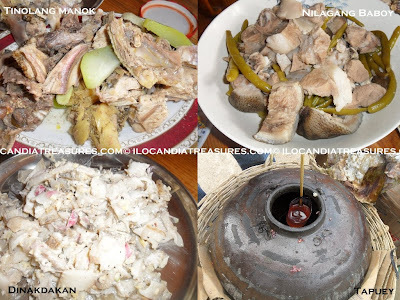 It was cooked as nilaga. I thought it was fish when I tried it because of blackish skin and the fat or the adipose tissue is firm. Steamed red rice and Baguio vegetables were also served to us. In one of the villages we visited, they put out the burnay or jar where the tafey or rice wine is stored. One has to scoop out the wine from it because it is composed of the red rice being fermented around a strainer tube and its juice concenrates at the tube’s center. Puto is a winner because you can taste the pureness of rice and its sweetness. I think boiled camote or sweet potato is the staple food in this locality because I saw it in every place we visited. 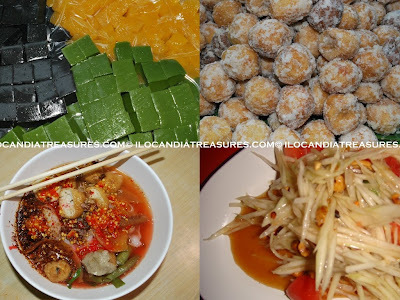 Rice cake topped with latik or coconut gratins was also served. Wild tea (guipas or subosob) was offered to us as a finale. 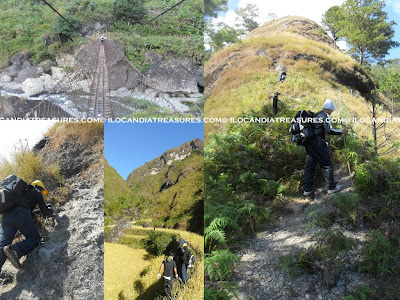 As early as the first week of the New Year, we embarked on a climb to the mountain range of Kibungan in the province of Benguet. What a great way to start the New Year! 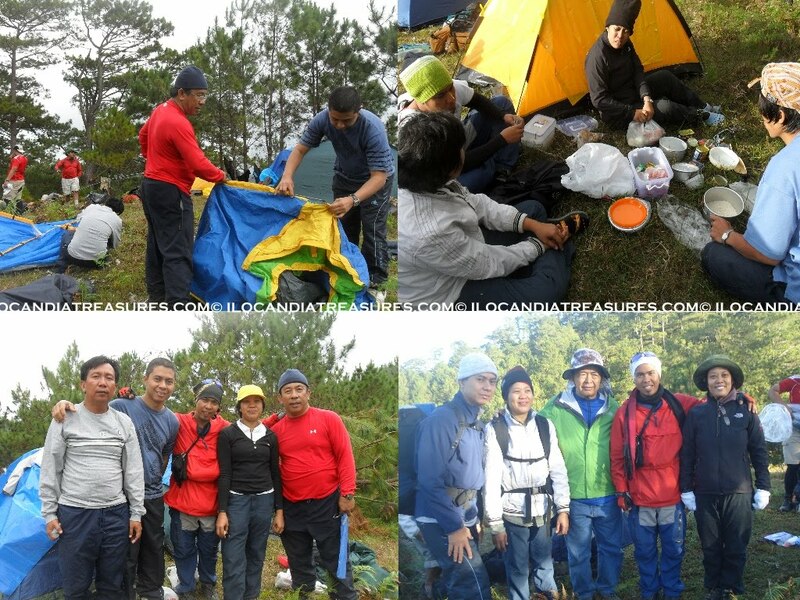 The Laoag Mountaineers Club headed by Bishop Sergio Utleg with members, Mai, Jay, Coleen, Amy, Fr. Vic and Fr Alex together with other climb groups namely Ayala Mountaineers, Sokisok and One Degree, we went up to the Cordilleras via the Bessang Pass. It is a historic site where the Battle of Bessang Pass took place located in Cervantes Ilocos Sur. It is where the first Filipino military victory achieved during the World War II against the Japanese imperial forces. We dropped by at this point for some photo ops. We stopped at the church of Avatan Buguias and we’re treated to snacks. We transferred to a jeepney that took us to Gambang, Bakun and Palina, Kibungan communities where we had fora on mining issue. We were treated to a lunch and series of snacks composed of native food. 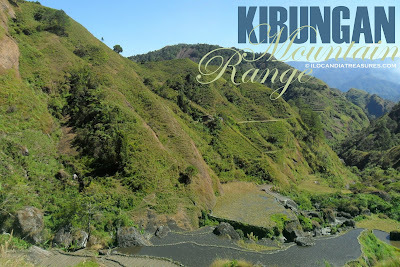 Kibungan is a town in Benguet known for its unique grand mountains. It was even mistaken to resemble that of Switzerland not only of the mountains but also the climate. It has an elevation of 2500 meters above sea level. Coolest months are December and January. Because of time constraints, we had to stay overnight at the Kibungan Convent and Chapel adjacent to the municipal hall. Early as 6am we headed to the jump off point at Sitio Tanap riding a big truck. It was a one hour ride to the place. We then started the trek passing through rice terraces. We passed through hanging bridges, rice fields, hills, small valleys, plateaus and mountains. We even had a rock climbing. There was a portion where steps were made on a mountain rock with steel bars or railing to hold on to but still looks stiff. We saw cliffs and ravines. We reached our base camp at Mount Bulalakaw after seven hours of trekking. Some of our members even went up to Mount Oten. We put up our tents while we assisted some of our members who came in late. We had our respective groupings and started to cook our dinner. I was tasked to fetch potable water from the river together with the guides and took the chance to take a bath. The water was cold perfect to douse my body, take off the sweat and dirt and freshen up my self. This was also a big help in acclimatisation. After taking dinner with my group, we had a bonfire set up by the guides and porters. I had a nice conversation with the guides. I had asked the ways of life the people have living in the mountains. They said that people are strong to come down and up to their houses in the mountains. They started when they were still young. It’s just usual for them to do the hike. I had also asked them how they transport person who is having emergency situation. According to them, they had to place the person in a blanket and tied in a pole. Bayanihan spirit is being observed during crisis. We have discussed also how they bury their departed loved ones. Some of the locals would still choose the way of mummification. They leave the corpse in a cave. The guides told me that there was a nearby cave where you can see mummies. 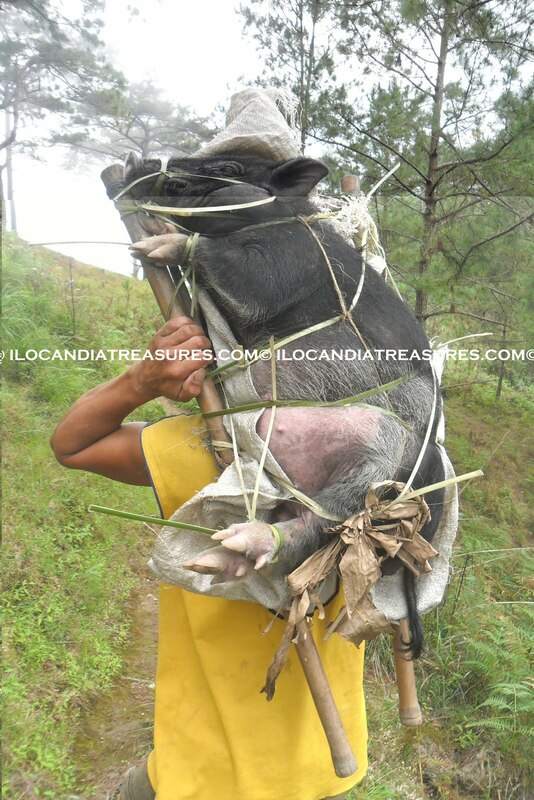 I have seen too how they transport a native pig to downtown and I took a photo of it. It started to get foggy in our base camp after 5pm, eventually after waking up early in the morning I saw my tent and other tents wet, full of dews. We really experienced a cold night. After taking our coffee and breakfast, we broke camp. We trekked down the mountains. I and Mai together with our guide did a clean up drive at one of the area. What fascinated me most in this climb was the harvest of rice by some old folks we passed by. We spent 5 hours coming down to the jump off point in Sitio Tanap. One by one arrived as we ate our packed lunch. We proceeded to the town hall of Kibungan to transfer to another ride towards La Trinidad and had a dinner at one of the convents. 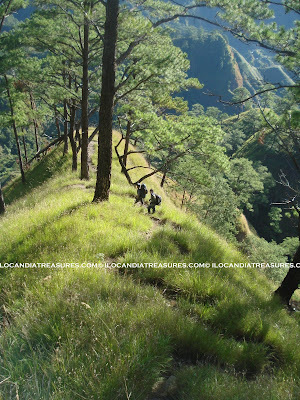 It was a chilling temperature when we departed for Ilocos This was another exciting climb but could be rated as 5/10 about its degree of difficulty.